Georgian Public Defender Nino Lomjaria cites Russian and de-facto leadership sources that the number of persons detained on the occupation line of Abkhazia amounted to 15, 000 in 2009-2017 and the number of detainees on the occupation line of the Tskhinvali region was 1, 063 in 2016-2017. “Cases of deprivation of life have also occurred on the occupation lines,” Lomjaria says in a special statement on the 10th anniversary of the Russia-Georgia war which made two Georgian regions of Abkhazia and Tskhinvali controlled entirely by Russia. Lomjaria says that the conflicts in the 90s and 2008 affected more than half a million people. “278, 103 out of them became internally displaced persons. 20 percent of the territory of Georgia is occupied. These figures indicate the challenges faced by our country and the huge responsibility of the central government,” the ombudsman said. She says that the general analysis of the IDPs' rights situation shows that their main problems remain the same over the years. “58 percent of the registered IDPs are still waiting for shelter. In some facilities, IDPs have to live in severe conditions; former collective centers have been poorly rehabilitated and repaired; the social and economic situation remains a challenge. “To realize the rights of internally displaced persons, the Public Defender considers that the following is neccesary: 1. Priority should be given to resettlement of IDPs from the facilities that threaten their lives or health; 2. A model focused on IDPs’ needs should be developed,” Lomjaria said. Lomjaria states that the rights situation of people living along the occupation lines has worsened after 2008. “The 350 km-long occupation line of the Tskhinvali region is controlled by 1 200 border guards of the Russian Federation, and 1 500 border guards control the 145 km-long dividing line of Abkhazia. Erection of barbed wire fences directly damaged more than 50 villages of Shida Kartli and Samegrelo-Zemo Svaneti regions on the Georgian-controlled territory,” she stated. Lomjaria says that locals daily face unlawful detentions, military exercises at the bases of the Russian Federation, the problem of drinking and irrigation water, as well as the poverty caused by the loss of agricultural lands as a result of the occupation. “In 2016-2018, two Georgian citizens, Giga Otkhozoria and Archil Tatunashvili, became victims of illegal actions of de facto law-enforcement agencies when they were passing checkpoints fully controlled by the border troops of the Russian Federation. Therefore, the Russian Federation, as a country exercising effective control on the occupied regions, is directly responsible for the violation of the Georgian citizens’ right to life,” Lomjaria said. Develop a social assistance mechanism for persons with disabilities living in the occupied territories, as well as lonely older adults, large families, etc. 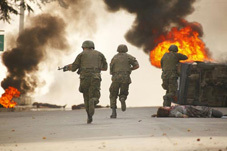 The War in Abkhazia from 1992 to 1993 was fought between Georgian government forces for the most part, and Abkhaz separatist forces, Russian armed forces and North Caucasian militants. The separatists received support from thousands of North Caucasus and Cossack militants and the Russian troops stationed in and near Abkhazia. Russia, Venezuela, Nicaragua, Nauru, and Syria have recognized Abkhazia and Tskhinvali as independent states since the 2008 war. The rest of the international community says the regions are integral parts of Georgia.